Policies in Deep Security are intended to be created in a hierarchical structure. As an administrator, you begin with one or more base policies from which you create multiple levels of child policies that get progressively more granular in their detail. You can assign broadly applicable rules and other configuration settings at the top-level policies and then get more targeted and specific as you go down through levels of child policies, eventually arriving at rule and configuration assignments at the individual computer level. As well as assigning more granular settings as you move down through the policy tree, you can also override settings from higher up the policy tree. Child policies inherit their settings from their parent policies. 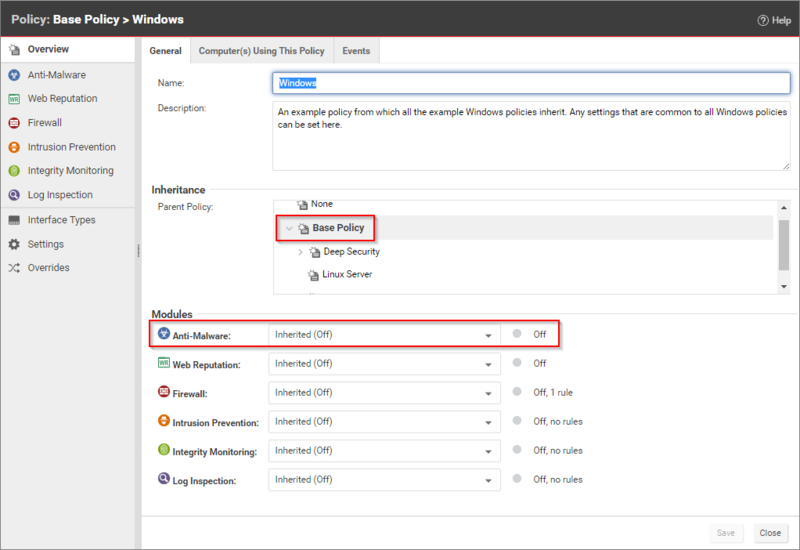 This allows you to create a policy tree that begins with a base parent policy configured with settings and rules that will apply to all computers. This parent policy can then have a set of child and further descendant policies which have progressively more specific targeted settings. Your policy trees can be built based on any kind of classification system that suits your environment. For example, the branch in the policy tree that comes with Deep Security has two child policies, one designed for a server hosting the Deep Security Manager and one designed for the Deep Security Virtual Appliance. This is a role-based tree structure. 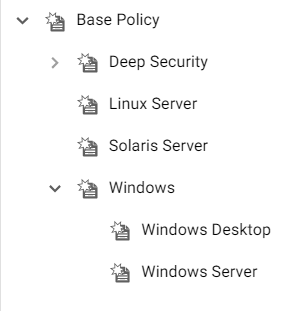 Deep Security also has three branches designed for specific operating systems, Linux, Solaris, and Windows. The windows branch has further child policies for various sub-types of Windows operating systems. The Overrides page shows you how many settings have been overridden at this policy or specific computer level. To undo the overrides at this level, click the Remove button. 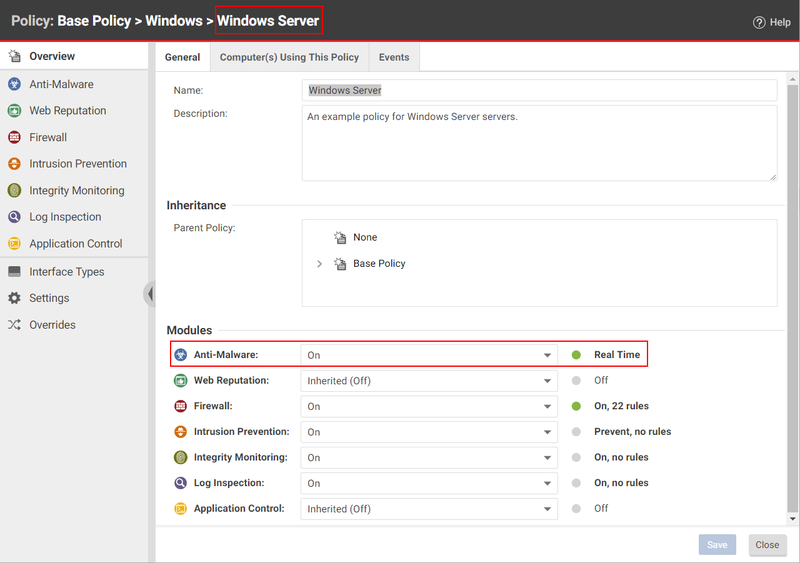 In this example, the Windows Server policy is a child policy of the Windows policy. Here, the anti-malware setting is no longer inherited; it is overridden and hard-set to On. You can automate override checking, creation, and removal using the Deep Security API. 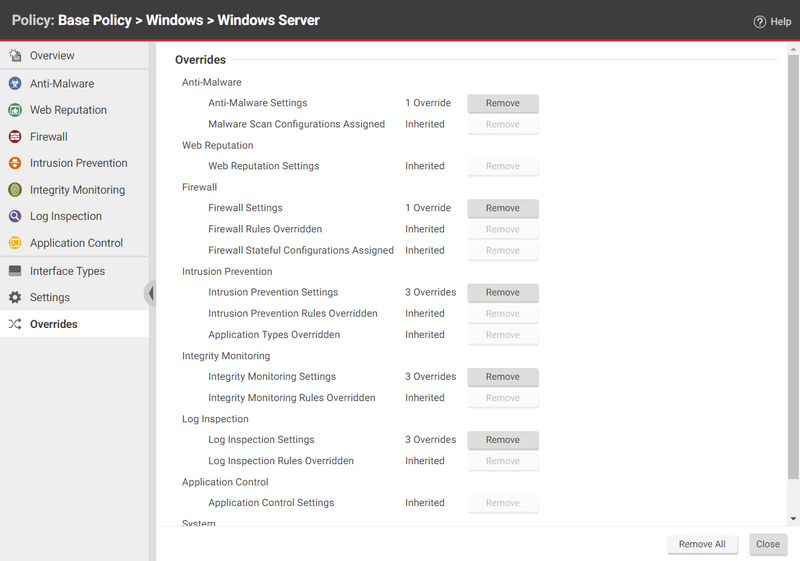 For examples, see the Configure Computers to Override Policies guide in the Deep Security Automation Center. Right-clicking a rule displays a context menu which gives you the two Properties editing mode options: selecting Properties will open the local editor window and Properties (Global) will open the global editor window. Most of the shared common objects in Deep Security can have their properties overridden at any level in the policy hierarchy right down to the individual computer level. You can always assign additional rules at any policy or computer level. However, rules that are in effect at a particular policy or computer level because their assignment is inherited from a parent policy cannot be unassigned locally. They must be unassigned at the policy level where they were initially assigned. If you find yourself overriding a large number of settings, you should probably consider branching your parent policy. Overrides are displayed by protection module. You can revert system or module overrides by clicking the Remove button.